Further details (where known) of the children of Thomas Findlay and Elizabeth MacDonald, and their descendants. James Findlay, born 9 February 1852, Inverness. Elizabeth Findlay, born 30 December 1853, Inverness. Margaret Findlay, born 15 December 1855, Clachnaharry. Thomas Findlay, born 27 August 1857, Clachnaharry. Robert Findlay, born 12 May 1859, Clachnaharry. John Alexander Findlay, born 14 May 1861, Clachnaharry. Margaret Findlay, born 16 January 1863, Clachnaharry. Roderick Findlay, born 23 August 1864, Clachnaharry. Alexander Findlay, born 8 March 1866, Clachnaharry. Trained as a ships carpenter at Stephen's yard in Glasgow. Died, aged 22 years 9 months, on 17th September 1874 at Clachnaharry. Buried in Findlay family plot in the graveyard of the Old High Church of Inverness. Never married. Elizabeth married Edward Jezzard, on 29th December 1881 at Clachnaharry. Edward was a Royal Marine based on H.M.S. Brilliant which was at Inverness at the time of their marriage, but he was originally from Sandwich, Kent, where he was born in Strand Street, on 6 June 1852 to Frank Jezzard, a blacksmith (latterly a ships chandler, deceased by December 1881), and Elizabeth Farley. Francis Jezzard and Elizabeth Farley were married July-September 1847 (Isle of Thanet, Volume V, Page 590). Francis Jezzard was almost certainly the Francis Jezzard christened on 30 May 1824 in St Clements, Sandwich, the son of William and Mary Jezzard. Elizabeth Farley was almost certainly the Elizabeth Farley christened on 18 April 1824 in St Peter's, Sandwich, the son of John and Elizabeth Farley. Margaret Gillett. Margaret married Norman Ravenhill . They had the following children: Frances Ravenhill born in 1941; Lillian Ravenhill born in 1943; Bridget Ravenhill born in 1945; Keith Ravenhill born in 1946. Maisie Gillett. Maisie married Eric Howard. They had the following children: Richard Howard; Sally Howard; Simon Howard; Jane Howard. Roderick Gillett. Roderick married Josephine Conner. They had the following children: Cecilia Gillett; Prudence Gillett; Rosalind Gillett. Frank Gillett. Frank married Marion ????????. They had the following children: Robert Gillett; Jeremy Gillett. Chaseley Wright drowned on 17th September 1939 in Plymouth Sound. He was on active service on board the carrier HMS Courageous in the South-West approaches (Southwest of Ireland), 150nm WSW of Mizen Head, Ireland when she was torpedoed by Kapitänleutnant Otto Schuhart in the Type VII U-boat U29. The carrier went down in only twenty minutes and 518 of her 1,200 compliment went with her, including her commander Captain W T Makeig-Jones. Catherine Wright. Catherine married Eric Kirk who served on the western front. They had the following children: Andrew Kirk; Stuart Kirk; Lindsay Kirk. Frank Jezzard born in 1944. Frank married Pauline Knight daughter of George Knight and Cecilia Dowding. Pauline was born in 1943. They had the following children: Katya Jezzard born in 1972; Rebecca Jezzard born in 1974. Stephanie Caplin born in 1924. Stephanie married Norman Howe. They had the following children: Rosemary Howe born in 1951; David Howe born in 1954. Maurice Caplin born in 1929. Maurice married Anne ???????. They had the following children: Alison Caplin born in 1952; Fiona Caplin born in 1955. Rosalind Jezzard . Rosalind married Ronald Allen. They had the following child: Deborah Allen. Dorothy Jezzard . Dorothy married Edward Burrows. They had the following child: Frank Burrows. Roderick Jezzard born in 1931. Roderick married Cynthia ??????? Janet Jezzard was born in 1932. Janet married Denis Richardson . Richardson was born in 1924. He died in 2000. They had the following children: Kaitrin Richardson born in 1958; Martin Richardson was born in 1960. Patsy Jezzard was born in 1935. Patsy married Edgar Barrett Graham . Edgar was born in 1935. They had the following children: Robert Graham born in 1960; Alan Graham was born in 1962; Elizabeth Graham was born in 1964. Robert secondly married Marybel ??????? in 1948. Edward Jezzard's ship was definitely at Inverness in early April of 1881 as he and his shipmates are recorded in the census of 5th April 1881. Edward and Elizabeth had their first two children Elizabeth Francis, born 19th November 1882, and Margaret Ada, born 7th February 1884, at 44 Wells Street, Inverness, but by the birth of their third child Edward Thomas K. in 1885 (Ref: 1885 Jul-Sep Eastry 2a 931), they had moved to Edward's home town of Sandwich, Kent. This probably indicates Edward's retirement from the Navy. By 1890 they had a fourth child, Evangelina Stone (Ref: 1890 Apr-Jun Eastry 2a 913), and for the census of 1891 we find the family living at 37 Strand Street, Sandwich, with Edward now working as a county court bailiff. 1891 Census (5th April) Eastry, Sandwich RG12/735 Folio 8. 37 Strand Street, St. Marys, Sandwich. At the time of the death of her Aunt Margaret MacDonald, on 3rd November 1895, Elizabeth Findlay\Jezzard was living at 1 Rose Cottage, Sandwich, Kent. For the census of 1901 Edward and Elizabeth were still in Sandwich. A further three children have been born Frank born 1891 (Ref: 1891 Oct-Dec Eastry 2a 923), Roderick John born 1897 (Ref: 1897 Jan-Mar Eastry 2a 986) and Robert (unnamed at the time of the census!) born March 1901 (Ref: 1901 Apr-Jun Eastry 2a 1022). Edward's occupation is given as "Naval Pensioner - Navy's Men" without any reference to any other occupation (ie. County Court Bailiff), so possibly they were living solely on his naval pension at this time. Young Edward was away having joined the Navy. 1901 Census (1 April) Sandwich RG13 Piece 831 Folio 57 Page 8. For the census of 1911 Elizabeth and Edward are living at 43 Cattle Market, Sandwich with their three younger childre. I believe that Edward Stone Jezzard died on 21 Nov 1916 (Ref: Eastry Vol 2a Page 1460), and Elizabeth Jezzard nee Findlay died on 18 Nov 1931 in Canterbury, Kent (Ref: Canterbury Vol 2a Page 1299). 1881 Census (4th April) Glasgow (644/9) Book 30. Page 23. Interestingly just down the road was a family called Cameron . 1881 Census (4th April) Glasgow (644/9) Book 36. Page 12. The reason that the Cameron family are of relevance is because on 28 June 1888 married Catherine Cameron. One assumes they met through being in the same neighbourhood and Catherine's brother being in the same trade as Thomas. Alexander Cameron, a Lieutenant of Police, and Mary Darroch, were married on 22 May 1853 in Glasgow, and their son Duncan was born 29th July 1857 in Clyde, Glasgow, and their daughter Catherine was born on 17th August 1859 in Anderston, Glasgow. Mary Darroch was born on the Isle of Jura, on 13 July 1817, the daughter of Archibald Darroch and Catherine Darroch who were married on 19th January 1813 on Jura. Kenneth James MacRae, a Chemical Engineer, married Virginia Blanche Lauterbach, a clerk, daughter of John W. Lauterbach and Virginia McCorkle on 30 March 1950 in Allegheny, Pennsylvania, USA. Virginia was born on 24 May 1930 in Dorseyville, Indiana Township, Allegheny County, Pennsylvania, USA. Kenneth and Virginia had two known children: Kenneth MacRae born about 1952 in Pennsylvania, USA, and Mary MacRae born on 8 September 1955. Kenneth died in the February of 1985 in Tarentum, Allegheny, Pennsylvania, USA. Virginia died on 27 November 2008 in West Deer Township, Allegheny County, Pennsylvania, USA. Lachlan MacRae was born on 14 December 1925 in Pennsylvania, USA. He died on 6 January 1977 in Dickson, Dickson, Tennessee, and was buried in Dickson County Memorial Gardens, White Bluff, Tennessee, United States. Margaret Findlay, born on 16 June 1891 at 147 Kent Road, Glasgow. On 26 March 1914 Margaret, aged 22 and a "stationer's assistant", married Alexander Smith, aged 36, watchmaker, who lived at 11 King Street, Coatbridge. Alexander was the son of George Smith, a jeweller, and Margaret Jeffrey. Margaret was resident at what seems to have been the family home, 64 Old Dumbarton Road, Glasgow. I believe that Margaret died 1 February 1967 in Coatbridge. Flora Bryce Findlay, born on 27 October 1898 at 9, Lumsden Street, Overnewtown, Glasgow. On 6 June 1924 Flora, aged 25 and a "typist", married John Gemmell Birrell, aged 26, commercial agent, who lived at 18 Montague Street, Glasgow. John was the son of William Lister Birrell, a dairyman, and Jeannie Gemmell. Flora's address was again given as 64 Old Dumbarton Road, Glasgow, so I would assume this is still the family home. John and Flora had a least one son William Lister Birrell born on 15 April 1927 at 15 Halbert Street, Glasgow. John Gemmel Birrell died on 21 February 1956 at 96 Langside Avenue, Glasgow. He was recorded as a Company Director (of David Scandlers & Co Ltd.) and his parents were confirmed as William Lister Birrell and Jeannie Gemmell although his father is listed as a Grocer rather than Dairyman and Jeannie Gemmell is named as Jane Duff Gemmell. The informant was James G. Birrell his brother, of 14 Willowbank Crescent, Glasgow. Flora Bryce Birrell, nee Findlay, died 17 November 1990 in Paisley and the informant was Muriel Findlay Searl, (nee Findlay), her granddaughter. A child died in infancy - from 1911 census. 1891 Census (5th April) Glasgow (644/9) Book 29. Page 1. Catherine, Thomas's wife must have been in the latter stages of pregnancy at the time of this census, as, ten weeks later, on 16 June 1891 she gave birth to another daughter, Margaret, born at 147 Kent Road. The next record of Thomas is as the witness on his father's death certificate of 8th November 1893. By this date the family had moved, his address on the death certificate being given as 9, Lumsden Street, Overnewtown, Glasgow. The family were still living at Lumsden Street for the birth of a further daughter, Flora Bryce, on 27 October 1898. This daughter was named after Flora C. Bryce, the grandaughter of Thomas's father's sister Catherine Findlay, (Thomas's 1st cousin 1 time removed). Why they should have chosen to name their daughter after Flora who would have been 24 at the time is not known at this time, but obviously the two branches of the family were "in touch". For the census of 1901 the family were still living in Lumsden Street, along with the daughter of one of Catherine's brothers, Catherine Cameron, shown as born in England. 1901 Census (7th April) Glasgow (644/10) Book 48 Page 7. 1911 Census (7th April) Glasgow (644/11) Book 28 Page 13. Sadly the next record of Thomas Findlay is that of his death. He died, aged 67, on 2 March 1925, less than a year after Flora's marriage. His death was recorded at 11 King Street, Coatbridge, the home of his daughter Margaret, and her watchmaker husband, Alexander Smith, who registered the death. From this it would seem likely that Thomas and his wife, Catherine, with the on set of old age and all their daughters married, had moved in with their son-in-law . Catherine Darroch, Thomas's wife, lived on a further sixteen years, dying, aged 82, on 25 November 1941. Her death was recorded at 96 Langside Avenue, Glasgow, the home of her married daughter, Flora Bryce Birrell. It was at this same address that the death of Flora's husband, John Gemmel Birrell was recorded on 21 February 1956. He was recorded as a Company Director and his parents were confirmed as William Lister Birrell and Jeannie Gemmell although his father is listed as a Grocer rather than Dairyman and Jeannie Gemmell is named as Jane Duff Gemmell, and the informant was James G. Birrell his brother, of 14 Willowbank Crescent, Glasgow. Flora Bryce nee Findlay died 17 November 1990 in Paisley and the informant was Muriel Findlay Searl, her granddaughter. .
Robert trained as an architect in Scotland where he worked on Carnegie Public Libraries, Aldourie Castle, and Moy Hall. Robert went to Montreal, Canada, in 1885 and worked for various firms of architects. Robert married Jane Fleming on on 29 June 1887, in Galt, Waterloo, Ontario. Robert's bride was actually recorded as Janis A. Fleming aged 26 the daughter of John Fleming and Janis Fleming. As it is certain that this is the correct marriage record due to her husband Robert being accurately recorded as aged 28, the son of Thomas and Elizabeth Findlay, one can assume that Janis = Jane making Jane the daughter of a John and Jane Fleming and born circa 1861. The 1891 census gives her age as 30 which also tallies with her being born circa 1861. Her year of birth given in the 1901, 1911 and 1921 censuses all differ, listing 1863, 1864 and 1864 (calculated) respectively. However the 1901 and 1911 censuses do agree on the month being May, with the 1901 census specifying the 24th of that month. Frank Findlay born on 26 May 1889 in Canada. He died on 10 Apr 1977 in Montreal, Canada. Arthur Findlay born on 1 Dec 1890 in Canada. He died in Mar 1950 in Westmount, Montreal. Edythe Findlay born on 5 Apr 1891 in Canada. Audrey Findlay born on 3 Feb 1894 in Canada.. In the same year as his marriage Robert won an architectural design competition to build Sun Life Assurance Co. head office on Notre Dame Street West, Montreal which was the foundation of his own Architectural practice and went own to become a respected and influential architect within Montreal and further a field in Canada. For the census of 1891 Robert and his family were living in the village of Côte-St. Antoine in the Hochelaga district of Quebec. For the 1911 census Robert and his family were still in in the Hochelaga district of Quebec. In 1912 Frank, Roderick's eldest son, graduated as an architect and went on to join his father's Architectural practice. During the Great War Frank enlisted and was posted overseas. At the time of his attestation he seems to have added a year to his age. Frank Robert Findlay - Born Monreal, Canada. Next of Kin Robert Findlay, father, 10 Phillips Place, Montreal. Born 26 May 1888, College Student. Description - parent age 26 years and 9 months, 5 ft 6" 34" chest (2" expansion), dark complexion, brown hair and brown eyes. Two large scars on side of neck. Some time circa 1915 (presumably after the attestation) Robert's eldest son Frank married Mabel June L. Trenholm daughter of William Henry Trenholm and Ellen Kerr Hogg. Mabel was born on 1 Jul 1887 in Monreal, Quebec. William Henry Trenholm was a distinguished citizen of Westmount being a partner in the Guaranteed Pure Milk Company, and the Mayor of Westmount for two years. There is an extensive family tree for this Trenhom family on the web at http://www.trenholm.org/trenholmNB/. Henry Findlay - Born 20 July 1916. Died 26 January 2010. In 1917 whilst in the U.K. en route to France, Frank again visited his Uncle Jack, (John Alexander) in Edinburgh. (To read a transcript off a letter written by his "Uncle Jack Findlay" to Frank's father Robert in Montreal reporting Frank's visit - click here). For the 1921 census Robert and his family were recorded at 419 Landsdowne Ave, in the Westmount district of Quebec. Looked after her father until his death, after which she moved to Edinburgh, where she lived , for the rest of her days. According to a letter of 1917 from John Alexander Findlay, in Edinburgh, to his brother Robert Findlay, Montreal, Canada, she was living as a companion with a Miss Lawson, and had been for the last 13 years, with arrangements to stay on as a companion to Miss Gray, a relative of Miss Lawson after that lady's demise. Margaret died 22nd October of 1931 at 17 Ainslie Place, Edinburgh, although her usual residence was 7 Mayfield Road, Edinburgh. The informant was J.A. Findlay, Brother, 13 Riselaw Crescent, Edinburgh. Never married. Roderick seems to have been a bright child judging by the mentions he gets in letters from his grandfather Robert MacDonald out to his son Roderick in Australia and by the time of the 1881 census he was working as a Railway Clerk in Inverness. Roderick initially emigrated to Montreal, sometime between August 1882 and 1885, probably to work for the Grand Trunk Railway, which would correspond with his occupation in 1881 in Inverness of "Railway Clerk". It is known that he was still in Scotland in August 1882 as in a letter from his Uncle Alexander MacDonald in Glasgow to his Uncle Roderick MacDonald in Australia it states "Roderick Findlay your namesake, he was the last man that saw John before he died and Maggy was constantly beside him. Roderick came to Glasgow on a visit at the time.". During the Riel Rebellion in the North West of Canada in 1885 Roderick fought in the government army for which he was awarded the North West Canada medal, 320 acres of land and $80.00. In 1886 Roderick, along with his brother Robert who had also gone to Canada, returned briefly to Scotland to visit their father. Sometime prior to 1889 Robert left the Grand Trunk Railway and joined the Canadian and Pacific Railway. By 1890 Robert was the chief clerk in the office of the Canadian and Pacific Railway and around the same time he married Matilda Anderson. For the 1891 census Robert and Matilda were recorded in the town of Ste. Cunégonde iin the Hochelaga district of Quebec. From this and later census records it would seem that Matilda was born in the September of 1863 in Canada (possibly English Canada, possibly French Canada) of a Scottish father and a Canadian mother (possibly French or possibly English Canadian). Etta Findlay born March of 1892 in Canada. Died unmarried on 13 August 1914 possibly drowned whilst swimming in Lake Michigan. Baby Findlay who died in infancy ?circa 1895? Roderick Frank Findlay born April 1897 in Chicago. Probably married Cora M. Deenik some time after 1930 and possibly after 1946. Roderick had passed on prior to March 1977. This information is gleaned from an obituary for Cora's death on 22 March 1977, which identifies her as the widow of the late Roderick Findlay. In 1893 Roderick and his family emigrated to the US via Alabama. 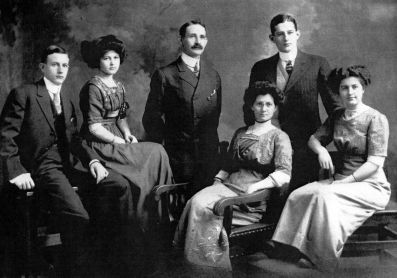 The family went to Chicago where Roderick was initially a cashier in Asonia Electric Co.
For the 1900 census Roderick was living in rented accommodation at 6333 Drexel Avenue along with his two children and a German maid (surname illegible). He was now working for a coal company, probably Philadelphia Reading Coal & Iron Co. This census also identifies that Roderick and Matilda had had a third child (probably between 1892 and 1897) which did not survive infancy. Roderick Findlay - Head. Born Aug 1864, aged 36. Married for 10 years. Born in Scotland of a Scottish father and a Scottish mother. Came to the US in 1893 (alien). Occupation - cashier in coal office. Matilda A. Findlay - Wife, Born Sep 1863, aged 37. Married for 10 years. 3 children - 2 living. Born in French Canada of a Scottish father and a French Canadian mother. Came to the US in 1893 (alien). Came to the US in 1893 (alien). Etta Findlay - Daughter. Born Mar 1892, aged 8. Born in English Canada of a Scottish father and a French Canadian mother. Roderick F. Findlay - Son. Born Apr 1897, aged 3. Born in Illinois of a Scottish father and a French Canadian mother. Augusta H****ka - Servant. Born Jul 1878, aged 22. Born in Germany of a German father and a German mother. Came to the US in 1882 (alien). For the 1910 census Roderick was still living at 6333 Drexel Avenue and working for a coal company. Roderick Findlay - Head. Aged 45. Married for 20 years. Born in Scotland of a Scottish father and a Scottish mother. Came to the US in 1893 (alien). Occupation - clerk in coal office. Matilda A. Findlay - Wife. Aged 46. Married for 20 years. 3 children - 2 living. Born in French Canada of a Scottish father and a French Canadian mother. Came to the US in 1893 (alien). Etta Findlay - Daughter. Aged 18. Born in English Canada of a Scottish father and a French Canadian mother. In education. Roderick F. Findlay - Son. Aged 13. Born in Illinois of a Scottish father and a French Canadian mother. In education. Sadly four years after this census Roderick's daughter Etta died, aged 22. Family sources say she drowned in Lake Michigan whilst swimming. Her obituary from the Chicago Tribune does not give a cause of death. Etta Findlay, at Muskegon, Mich., on the 9th inst., only daughter of Roderick and Matilda Findlay, aged 22 years. Montreal. Canada, papers please copy. For the 1920 census Roderick was still living at 6333 Drexel Avenue and working for a coal company although now recorded as "Chief Clerk". His son Roderick is still at home but working as a salesman in a stationary store. Roderick Findlay - Head. Aged 57. Came to the US in 1893 via Alabama (alien). Born in Scotland of a Scottish father and a Scottish mother. Occupation - chief clerk in wholesale coal. Matilda A. Findlay - Wife. Aged 57. Came to the US in 1893 via Alabama (alien). Born in English Canada of a Scottish father and a English Canadian mother. Came to the US in 1893 (alien). Roderick F. Findlay - Son. Aged 22. Born in Illinois of a Scottish father and a English Canadian mother. Occupation - salesman in stationary store. In 11 June1922 Robert was still living in Chicago at 6333 Drexel Avenue as it was from there that he wrote to his brother Robert in Montreal eliciting help for their brother Thomas in Glasgow. In the letter he mentions a forthcoming fishing trip by himself and his son Roderick to Northern Michigan. He also gives a fairly bloodcurdling description of an operation he had on his nose, which has cost him $200. He also complains about the increase in his rent to $77-50 per month. Transcript of a letter from Roderick Findlay in Chicago to his brother Robert in Montreal, expressing concern over the welfare of their brother Tom in Glasgow, and his family. I enclose letters received from Tom's daughter Mary. Tom is surely in distress. He has been out of work now for three months. His wife is now seriously ill. I presume it is worry & a nervous breakdown, probably brought on by Tom's recent illness first & then his being laid off work on account of the engineers strike over there. landlord raised our rent again this year. We are now paying &77-50 per month. Rents are high & for the present one cannot help themselves it costs terribly to move even if you could get a suitable flat to move to, but with all that I am glad that with Till's assistance to send Tom a remittance each month. Poor fellow he needs it. I am going away the end of this week, (Roddie & I), to Northern Michigan for a weeks fishing. If you can spare a few dollars for Tom I am sure it will lighten his heavy heart at this distressing time. All well at present. For the 1930 census Roderick was still living in the same area of Chicago however the census form makes the address somewhat ambiguous and would seem possibly to be an apartment on the corner of Drexel Avenue and East 64th Street. Roderick is still working as a clerk in a coal company. Roderick Junior is still at home now working as a pricing clerk in a wholesale hardware business. The rental for their apartment is $80 per month, which would seem commensurate with that mentioned in the letter of 1922. The family does have a radio! Roderick Findlay - Head. Aged 64. Married for 25 years. Born in Scotland of a Scottish father and a Scottish mother. Came to the US in 1893 (naturalized), Occupation - office clerk in coal & iron company. Matilda Findlay - Wife. Aged 64. Married for 25 years. Born in French Canada of a French Canadian father and a French Canadian mother. Came to the US in 1893 (alien). Roderick had maintained contact with his Uncle Henry MacDonald in Houston Texas from the time of his move to Chicago until Henry's death in 1908 through a series of letters and possible occasional visits. It would seem that this contact was continued with Louis, Henry's son and Roderick's cousin, after Henry's death as Louis named his second daughter Etta born in 1919 in remembrance of Roderick's daughter Etta who had drowned. As a consequence Roderick gave the MacDonalds a silver filigree necklace that was given to Etta Findlay on her graduation. This is still with the MacDonald descendents in Texas. 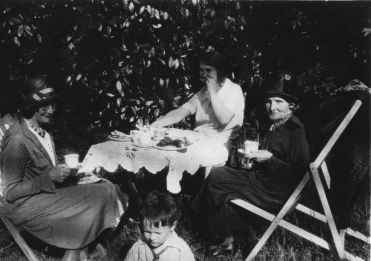 In 1941 Louis and his wife Isora visited Roderick and Matilda. Photographs taken during this visit show Roderick, Matilda and Isora outside the family home, which was now 6431 Drexel Avenue. (Louis named his second daughter Etta in honour of Roderick's daughter Etta who had drowned. 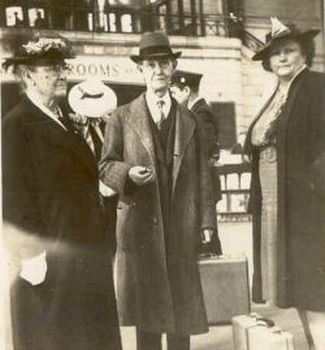 "In return" Roderick gave the MacDonalds a silver filigree necklace that was given to Etta Findlay on her graduation. This is still with the MacDonald descendents in Texas. Sadly Roderick died three years later on 1 July 1944. The obituary carried by the Chicago Tribune gives the home address as 6431 Drexel Avenue. Roderick was interred at Oak Woods cemetery, Chicago. Matilda followed her husband only two years later on 23 January 1946. The obituary carried by the Chicago Tribune gives the home address as 10521 S. La Salle Street, and she too was interred at Oak Woods. Roderick Findlay, July 1, 1944, of 6431 Drexel avenue, son of the late Thomas Findlay of Inverness, Scotland, devoted husband of Matilda Anderson, loving father of Roderick Fred Findlay and the late Etta Findlay. Services at chapel, 7938 Cottage Grove avenue, Monday, July 3, at 2:30 p.m. Interment Oak Woods. --Matilda Findlay of 10521 S. La Salle Street, beloved wife of late Roderick, fond mother of Roderick F. Findlay. Services at chapel, 7838 Cottage Grove avenue, Saturday, Jan. 26, at 2 p.m. Interment Oak Woods. Rad. 0220. As to their son Roderick Frank it seems that probably married Cora M. Deenik some time after 1930 and possibly after 1946. Roderick had passed on prior to March 1977. This information is gleaned from an obituary for Cora's death on 22 March 1977, which identifies her as the widow of the late Roderick Findlay. Cora would seem to have been born in 13 Feb 1891, according to the Social Security Death Index and had at least three sisters, Susan, Elizabeth and Frances and two brothers Matthew and John. As there is mention of nephews and nieces but NOT sons or daughters I would suspect Roderick and Cora had no children. Died on 4th July 1866 aged four months. Buried in Findlay family plot in the graveyard of the Old High Church of Inverness.